The optimal strategies to treat the multiligament injured knee remain controversial. While it is generally accepted that the cruciate ligaments are best managed with reconstruction, there is a paucity of data to help guide management of the MCL in the multiligament injured knee. Treatment of the MCL may be influenced by surgical timing, injury pattern, and location. MCL surgery in this setting is debatable, and it remains unclear if repair or reconstruction yields a better outcome. An ACL/PCL/MCL injury falls into the Type III category of the Schenck classification. The surgical anatomy of the medial side of the knee including the bony attachment sites is the key to successful ligament repair and/or reconstruction. 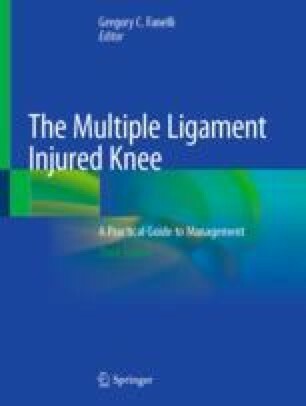 This chapter will focus on our current strategy for the management of the MCL in the setting of a combined ligament injured knee. Particular attention will be placed on anatomy, diagnosis, surgical timing, surgical technique, and a review of the best available evidence in the current literature.